This is an edited version of the WikiPedia page on the subject of Kendo. You will find some basic information that we hope will be useful. Any terminology that you do not understand can be determined by visiting the 'Terminology' page of this website. The shinai is meant to represent a Japanese sword (katana) and is made up of four bamboo slats, which are held together by leather fittings. Kendōka also use hard wooden swords (木刀 bokutō?) to practice kata. Protective armor is worn to protect specified target areas on the head, arms and body. The head is protected by a stylized helmet, called men (面), with a metal grille (面金 men-gane) to protect the face, a series of hard leather and fabric flaps (突垂れ tsuki-dare) to protect the throat, and padded fabric flaps (面垂れ men-dare) to protect the side of the neck and shoulders. The forearms, wrists, and hands are protected by long, thickly padded fabric gloves called kote (小手). The torso is protected by a breastplate (胴 dō), while the waist and groin area is protected by the tare (垂れ), consisting of five thick vertical fabric flaps. A cotton towel (手拭い tenugui) is wrapped around the head, under the men, to absorb perspiration and provide a base for the men to fit comfortably. 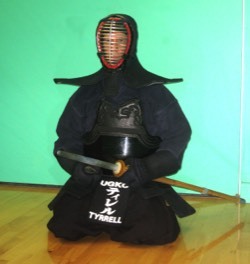 Modern kendo techniques comprise both strikes and thrusts. Strikes are only made towards specified target areas (打突-部位 datotsu-bui) on the wrists, head, or body, all of which are protected by armor. The targets are men, sayu-men or yoko-men (upper left or right side of the men), the right kote at any time, the left kote when it is in a raised position, and the left or right side of the dō. Thrusts (突き tsuki) are only allowed to the throat. However, since an incorrectly performed thrust could cause serious injury to the opponent's neck, thrusting techniques in free practice and competition are often restricted to senior dan graded kendōka.